Adam Sandler must be getting desperate. It’s a crying shame that he agreed to be in the remake of the 1974 film The Longest Yard. From the writing to the acting, this film embodies everything that keeps me away from the cinema. In the landscape of contemporary American cinema, this film represents the extreme of barren land: empty of content, conceptual intention, and skill. Not only is the film idiotic in its conception, but its enactment is an even greater disappointment. When MTV and Happy Madison Productions combine their forces, the result it a weak attempt at keeping Sandler’s career alive while still trying to be “hip” and “cool” with pop-rock and rap music. But unfortunately, there isn’t much left for viewers to indulge in except for sophomoric humor and crappy music. Not a minute of this film makes any sense or resembles anything that would ever happen in the real world. Cause and effect are meaningless. The writers must have assumed the audience would check reason and logic at the door. I didn’t, which was a mistake that almost caused me to publicly weep for cinema. Adam Sandler (50 First Dates, Spanglish) demonstrates again how unoriginal he can be, playing yet another wise-cracking, easygoing fella who likes drinking and making fun of people. This time his character is Paul ‘Wrecking’ Crewe, an ex-quarterback turned drunk lunatic. Depressed about being banned from football for shaving points and throwing a game, Paul goes on a high speed police chase and is sentenced to three years at the Allenville Penitentiary. Upon arriving, Paul is recruited by the warden (James Cromwell) to put together a football team of convicts to play an exhibition game against the guards. From here, we get a barrage of meaningless celebrity cameos that make up the cast. You’ve got your ex-football players (Brian Bosworth, Bill Romanowski, Michael Irvin), pro wrestlers (Bill Goldberg, Steve Austin), well-known broadcasters (Dan Patrick, Jim Rome, Chris Berman) and a pop-rap star (Nelly). Most of the jokes rely on the actual presence of the celebrity to be funny, but it proves to be more embarrassing than comical. When the big game starts, the warden threatens to put Paul in the slammer for 30 more years if the inmates win. So again, Paul is faced with the moral predicament of either throwing the game and letting his team down, or spending unrealistically more time in jail for winning. I’m not going to tell you which he chooses, but I’m sure with the already spelled-out formula, you can figure it out on your own. The sheer lack of originality and realism reeks throughout this entire picture. In one scene, a couple of the convicts break into the guards’ locker room and replace a bottle of steroids with estrogen. Why would these killers and rapists break out of their cells just to play a prank? Wouldn’t they be more interested in escaping, seeing as how they have already gotten out from behind the bars? 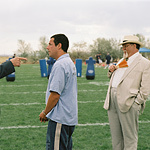 The warden’s assistant, a man who looks like Colonel Sanders, doesn’t have any lines in the film, yet he stands in the background for a portion of the scenes. Why? So that Sandler can ridicule him for our enjoyment. Truth be told, it just isn’t funny. It’s lazy writing and an even lazier display of creativity. But hold on... isn’t there another movie where Adam Sandler plays a football player? And aren’t there big dumb idiots on that team? And doesn’t Rob Schneider make an unfunny cameo with the same lines? And hey, wait a minute, isn’t Colonel Sanders in that one, too?! Yes indeed folks, it’s called The Waterboy, and instead of wasting your time with this, I suggest you go to your local video station and pick that up. Or perhaps drive to the theater, stay in the car, and stick your head inside the glove compartment for a few hours. This will save you eight bucks and I promise you’ll have a better time.